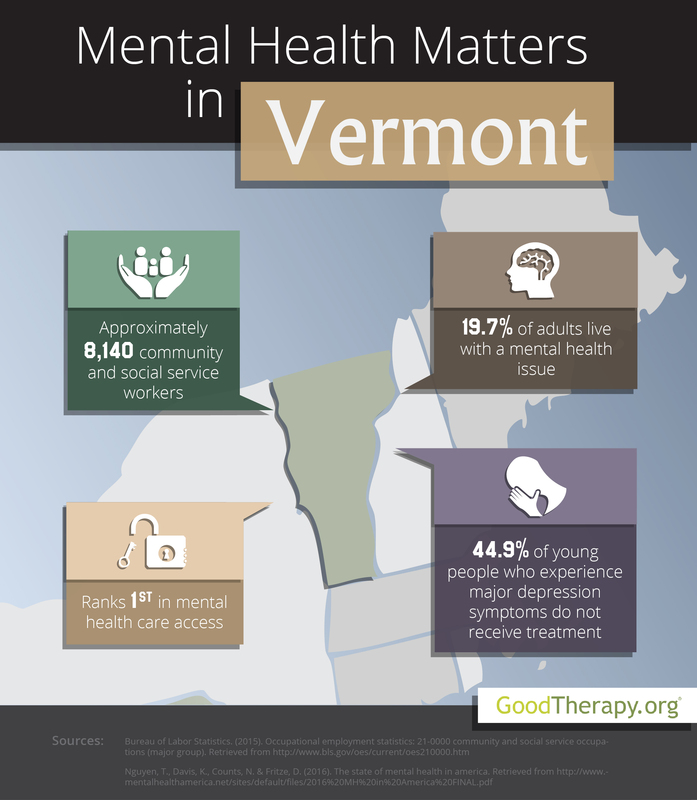 Find a therapist in Vermont with GoodTherapy.org. 626,042 people inhabited Vermont in 2015. Roughly 94.8% of the population is white, 1.3% is black, 1.6% is Asian, and 0.4% is American Indian and Alaskan Native. Females make up 50.7% of the population. Approximately 19.2% of residents are under the age of 18, while 17.6% are 65 years of age or older. 8,140 people in Vermont were employed as clinical social workers, religious workers, probation officers, community health workers, nurses at residential treatment centers, clergy members, health educators, community health workers, and marriage and family therapists in Vermont. In 2016, Vermont was given an overall mental health rank of 4th in Mental Health America’s (MHA) annual survey. Researchers from MHA and therapists in Vermont believe this top 5 ranking is related to factors such as high rates of high school graduation, and low rates of obesity, toxic chemical release, unemployment, and violent crime in the state. In addition to the overall rank, Vermont was 14th in adult ranking, 3rd in youth ranking, 1st in access to mental health care, and 45th in prevalence of adverse mental and behavioral issues. Mental health analysts posit the state’s low prevalence ranking correlates with high rates of child maltreatment. Adverse psychological, emotional, and behavior issues affect Vermont residents across all age groups. The state is ranked 37th for adults with any mental health issue, 36th for substance use among adults, 49th for adults with strong suicidal ideation, 45th for young people with substance use issues, and 30th for young people with severe symptoms of depression. According to a 2014 behavioral health report by the Substance Abuse and Mental Health Services Administration (SAMHSA), from 2012-2013 the percentages of cigarette use among teenagers, illegal drug use among teenagers, and binge drinking among residents ages 12-20 were all higher in Vermont than in the country as a whole. However, it is relatively easy for residents to find a therapist in Vermont and access the mental health services that are available. The 2016 MHA survey shows Vermont was ranked 1st for adults experiencing adverse mental health conditions who did not receive treatment (indicating a low percentage), 3rd for adults with mental health issues who are uninsured, 2nd for adults with disabilities who could not see a doctor due to financial barriers, 3rd for young people with major depression who did not receive mental health care, 2nd for young people with severe depression symptoms who received consistent depression treatment, 7th for children with private insurance that does not provide mental health coverage, and 4th in mental health workforce availability. As of 2016, there are 273 residents for each mental health provider or therapist in Vermont.